Neville Chanin - "The Legend"
British cyclist Neville Chanin rode more than a million kilometres on cycle tours around the world. Throughout June - September 2011, Stroud's Museum in the Park provided a small display of Neville's memorabilia. The items were donated to the museum following his sad death. Neville Chanin was born in Croydon in 1935. He moved to Butterrow, Stroud, in 1976 and lived there until his death in April 2010. 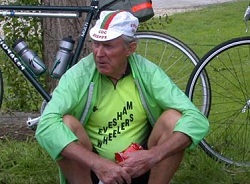 He rode more than a million kilometres on cycle tours in Britain, Europe and around the world. His name is well known in cycling circles nationally and internationally. The display in the Museum's Collectors' Room displayed a selection of the documents, photographs, trophies and other objects donated to the museum following his death. Neville Chanin was a talented and successful cross country and distance runner, but in 1948 he saw Reg Harris, British Cycling Sprint Champion, competing in the London Olympic Games. It sparked an enthusiasm for cycling, which became a lifelong passion. He went to Paris to see the finish of the Tour de France in 1957. 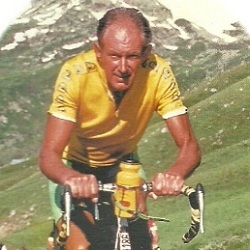 Each summer for the next fifty years he arranged a cycling holiday to watch the Tour and cycle part of route, including some of the toughest mountain stages. Starting in 1960 he organised more than forty annual tours to more remote destinations, including the Middle East, Cuba, North, Central and South America, the Far East, Australia and New Zealand. A list of his main cycle tours is available from this link. Chris Harvey both ran and cycled with Neville and has arranged with South London Harriers for us to publish this excerpt from their magazine. Click here to view details of Neville's cross-country records.